Today’s free web design resource is a big one! 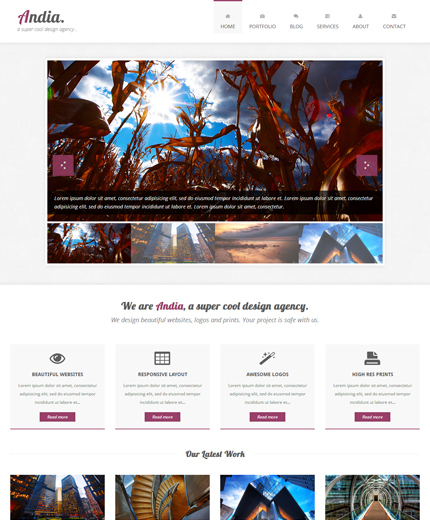 It’s a responsive agency/portfolio HTML template named Andia and built with Bootstrap. Andia comes with 7 fully responsive pages, Home, Home 2, Portfolio, Services, About, Contact, Pricing Tables and it’s perfect for creating a website for a small business or a personal portfolio. Some of Andia’s features include: responsive layout, responsive image sliders, filterable portfolio, AJAX contact and email subscription forms, Flickr photos, Font Awesome icons, Google Maps, etc. So, take a look at the live preview below, download the template and let me know what you think. Read the ChangeLog and see what has changed. You can use this template in personal projects. You can’t remove the footer copyright link. Support is not guaranteed or timely. You can use this template in commercial projects for yourself or your clients. You can remove the footer copyright link. Support is free and fast. These are versions of the template that come from the quick tutorials that I publish from time to time. I get the ideas for these tutorials usually from user questions or from my everyday web development work. These versions might have NOT been included in official releases of the template. Take a look at the Andia testing versions here! Photos used in the live preview by: Paul Bica, Norway Geographical’s Nature Photos, Shermeee, envato. Anli, sadly i’m just about quitting on using this template because of the flaws in portfolio page that only appear in downloaded version. That’s not fair, please help, i promise i’ll give you credits on the final website but please! Hey, on the portfolio i want to eliminate the ALL tab and for just one section to show, not all. Can you please let me know what i have to remove in order for all images not to show. In order words remove the “all” tab and start at the “web-design” tab or any other tab. like to use this design to build an free downloadable template with my own HTML/CSS for another CMS. Will i be allowed to do this if i link to this template as base for my work ? Would the portfolio page work the same with videos? And if so would this work with youtube embeds? I have looked at a LOT of responsive designs and grids… currently I have not found a tutorial that explains exactly how to match up the grid with a design… how things proceed from that point. I tried dozens of responsive designs and NONE actually worked responsively in my android phone! OR the responsive DEMO .. either their version’s or the Firefox plugin responsive resize. Till this (and I also checked one of your other templates) design. When I learn I need an authority that I trust. So thank you for being that authority. I am going to use your template for my art site and also use it to understand and learn more about responsive design.. I find numbers very difficult its like being dyslexic but with numbers and to me responsive design seems to be all about numbers. I could just use a template and go on my merry way however where is the control in that? I could go use a WordPress theme if i wanted to lose control. I am not sure if you meant your site to be a learning authority but it has now become so:) Thanks once more. I only played a little … it was also very easy to play with the slider as well i only had to change the html. I always thought you had to have a program. Wish you had a list. how to add sub menu in this templet? Very clean and tidy, i like it!! backward link guaranteed, thanks. I would love to use this theme. The code seems just fine but the problem I have is there are no drop down menus. If at least one menu item had a drop down I’d be styling. Dam! Good work though! Yes, please put out a version with a drop down, “sub menu”. How I can transform the logo image in a responsive image on this template? I don’t understand what you’re trying to do with the logo. Can you explain it better? Thanks. Congrats for your work! I have used it for a website but I have problems with the contact form. I have changed the email ( $emailTo = ) in “sendmail.php” but I don’t received any email when I probe it. Please cand you tell me if I have to change anything else? Thank you! Thanks. No, you don’t have to change anything else. Can I take a look at your site? I’ve same condition, I have changed the email in sendmail.php, i but there is no email received on my email, I only change the $emailTo content with my email. Can I delete “Copyright 2012 Andia – All rights reserved. Template by Azmind” and place a link to Azmind at the imprint? You’re welcome. Please read the license paragraph above. I read the comments and have the same problem described by other ones before. Maybe you have an idea? I tried a lot of things, but can’t find the problem. This template is really awesome!! thank yoU! I need help w/ something. The portfolio filter functions work great on desktop view, but when I view w/ my smartphone (LG G2) it seems to cut off projects and only display the first few in the category. Any tips on correcting this? You’re welcome. I’ll check it out. Can you tell me where I can set a charset into the contact formular so I can use German Umlaute (mutated vowel) like ü (uuml;) ? I don’t know, I’ve never used German. How do I get Flickr photostream for my images in the footer. Tried to change in flickrfeedjs,and script.js but nothing working. Hi asap. You just have to replace the Flickr id with your own in “scripts.js”. How do I add submenu like dropdown menu on main menu? I’ve tried, but still not work.. please..
I’ve one problem, that’s about testimonials item. How do I integrate with database, I’m confuse to set active or non-active class each testimony.. I have created a responsive site at http://smoljanovic.eu using your template. Thanks. Never got twitter feed to work though, so I never used it. You’re welcome! I’m glad I could help. Great looking template. I’m tempted to use it, but I can’t get the twitter feed to work. New to twitter as well. Probably something simple, but I need the latest tweets to display. Do I modify scripts.js or some other file? Thanks. The twitter feed doesn’t work in this version. Maybe I’ll fix it (or delete it) in the next version. I find your wordpress themes really beautiful and I have a question about the theme named “Andia”: Is it compatible with WordPress 4.0 and up?? … knowing that WP 4.1 is in beta since a few days…. Thanks Diana. Andia is not a WordPress theme, but only a HTML template. Beautiful work again – thank you Anli – I used v. 1 for a personal little site and really found it to be very easy to work with and a very elegant look. Rolling out another site and will certainly credit you for this – very generous. Thanks Ron! I’m glad I could help. How to replace slide with a embed video? I might create a tutorial about this in the next few days. I am using this template for my portfolio, but have run into a roadblock. When someone sorts my work by category and then clicks on a thumbnail, I have it so the thumbnail links them to another page with a larger view of the work. But when the user goes back, either by using the back button or the back option in the browser, the site doesn’t retain the sort and the user has to sort again. Is there a way around this? Can I make sure that when the back button is used, the work will remain sorted instead of going back to showing all thumbs? You can do it using the “back button in the other page” with PHP, for example. Sorry, the comments are closed. If you have any question or suggestion, please use the Contact page.